Eating foods rich in probiotics adds good bacteria to your system. Adding probiotics to one’s diet alone, however, won’t help if the bacteria has little to eat. That’s where prebiotics come in. “You can pop all the probiotic supplements you want, but if you are not eating fruits and vegetables with fiber, you’re not feeding them,” said Elaine Magee, corporate dietitian for national grocer Albertsons’ Wellness Services. Nondigestible plant fiber feeds the good bacteria and starves the bad, thus promoting the growth of beneficial bacteria and decreasing pathogens. 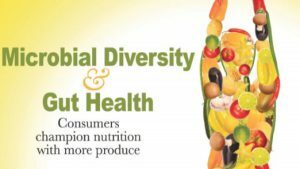 Just as diversity within the microbiota is associated with good health, the same can be said for sources of fiber. Not all types of plant fiber meet the requirement to be considered prebiotic. The fiber must be specifically used by a microbe and benefit health. Fruits and vegetables contain different types of nondigestible fiber, the most common are complex carbohydrates. Each type feeds different good bacteria. Therefore, eating a variety of fruits and vegetables can help to ensure the kinds of food needed to keep microbiata healthy. Raw foods have more nondigestible fiber than cooked foods, since heat breaks down the fiber. It’s better to cook a vegetable like asparagus al dente to preserve as much fiber as possible. The fiber from prebiotic foods passes undigested through the small intestine to the colon, where the bacteria ferment it. The fermentation process creates byproducts that are then absorbed to provide energy for cells.